I'm really picky when it comes to faerie books. Sometimes they tend to bore me with all the information that goes into them, so they're usually very hit or miss for me. 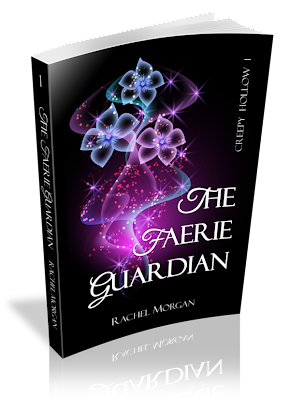 That said, I was a wee bit wary going into The Faerie Guardian. Which means I'm also super happy to say that this book was great. Definitely one of the better faerie books I've read. Rachel Morgan did a great job of creating an entertaining and unique voice for her main character, Violet, from the very beginning of the book. That originally drew me in and kept me going, and everything was uphill from there. Violet: I really liked Violet! She was smart and cautious, but she wasn't a total jerk either. She had snark and was so funny, but could take a situation seriously when it was necessary. If I were to know her in real life, we'd totally be friends. The best of friends, actually. Nate: I saw his little thing with Violet coming from a mile away, from the moment she thought he was cute and his face was plastered to that algebra book. Nate...I don't really like him. At all. I actually kind of want to slap him. He and I will now and forever have a love/hate relationship. Ryn: THIS IS MY BOY RIGHT HERE. He was such a jerk, but I can't help it--his character was so strong and I liked that. Plus, he was soooooo not perfect, but he...just. Goodness. This boy makes me speechless. I don't think any words I can give you will do him justice, so I'm going to leave it with what I said. If you want to know more, you seriously need to read this book. Plot. I can honestly say I did not see it coming. I totally SHOULD have, and in hindsight, I smack myself, but I was shocked. WHAT I'm talking about, I'm not going to say, but if you've read the book you know. Kudos to Rachel Morgan for throwing me through a fire-framed loop. I swear, this story was so much fun to get into. Romance. I am Team Ryn, in case you had not noticed. Which is completely silly, considering there isn't much reason for teams (yet? ), but I'm still rooting for my boy. I wasn't much impressed with Nate &Vi's little relationship they had going. That's probably because of my opinion of Nate. But still. They had a couple sweet moments, but other than that, I felt so-so towards those two TOGETHER. The ending. Um, there's a sequel. I must read it. Sometime soon, hopefully.